Conflict and Development Foundation is built upon the collective experience of its scholars and development practitioners who seen the dynamics of conflict and development first-hand throughout the world. Dr. Edwin Price first began to explore this dynamic of Conflict and Development as a young Peace Corps Volunteer in the British colony of Sarawak (present day Malaysia) in the 1960s. Working with the indigenous hill tribes, he saw first hand how competition and imbalance between resources, technologies, and cultures created ripe conditions for conflict. Throughout the world, we have seen this dynamic persist. Guatemala and neighboring countries of Central America have significant income disparities that are not improving, causing an unstable region with high levels of violence. Rwanda has struggled with its history for the last two decades and has become one of the success stories of Africa. Yet is it still in an unstable region and there are both internal and external forces that still are creating conditions for conflict. Afghanistan has been a crossroads of conflict for millennia yet its people and culture still thrive. Iraq is the birthplace of agriculture and yet it has fallen decades behind in agricultural productivity due to conflict. Agriculture is a source of national pride and has the opportunity to be a unifying force amidst discord. 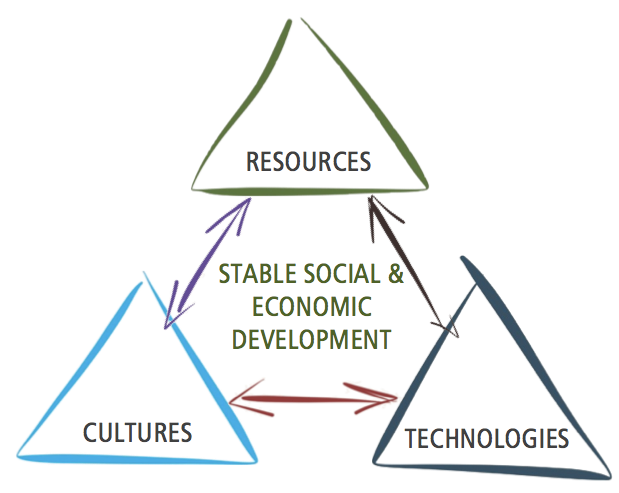 The basic premise of Conflict and Development scholarship is that there must be balance in an economy between resources, technology, and culture to mitigate the tendency towards conflict. Differential technologies for exploiting a common resource at the interface of cultures tend to create conditions of conflict. Similarly, differential access to resources at the interface of cultures tends to create conditions of conflict.